Will a Hot Tub Help You Lose Weight? Posted on February 27, 2018 , in Hot Tubs. Hot tubs have so many wonderful health and wellness benefits. In addition to their therapeutic advantages, they often become a focal point of the home and are a gathering point for social occasions, celebrations and family time. One benefit that many people do not consider when shopping for a hot tub is how they can help you lose weight. Hot tubs are the perfect environment to perform low impact, joint friendly exercises that can help individuals burn calories and assist in reaching their weight loss goals. Sitting the warm water of a hot tub increases blood flow and the body’s heart rate and is the ideal setting for those that suffer from joint problems or muscle pain and find it difficult to perform traditional land exercises. If you are looking to make your hot tub as versatile a purchase as possible, start using it to work out. Here are some simple exercises to help you get started. Stand in the middle of your hot tub with your feet flat on the floor. In a slow, controlled motion, rise up to the balls of your feet and hold the position for 3 seconds. Slowly lower your heels back to the floor and return to your starting position. Stand in the middle of your hot tub away from the walls. Submerge your body until your shoulders are completely covered in water. Begin to roll your shoulders forward and backward in a loose, circular motion. This exercise helps to stretch muscles, improve joint flexibility and boost circulation. While seated in your hot tub, extend your legs towards the middle and lift slightly off of the floor. Keep your core engaged and rotate your legs in a pedaling motion as if you were riding a bicycle. Stand in the middle of your hot tub so that you have plenty of room to move freely. Place your arms across your chest and tighten your core. Begin to twist from side to side, exhaling as you twist and inhaling as you release. Keep your shoulders relaxed and continue to try and improve on your range of motion. Hold the wall of your hot tub and face inwards. Quickly bring both knees towards your chest in a fluid motion and extend them straight to your starting position in a rapid, smooth movement. Keep your core muscles engaged throughout the entire exercise. In addition to exercise, hot tubs provide numerous relaxation and stress-busting benefits, all which contribute to living a healthier lifestyle, which is important for weight loss. Taking an evening soak to unwind and help yourself sleep better can give you the rest that you need to not be tired and craving extra sugar or caffeine throughout the day. 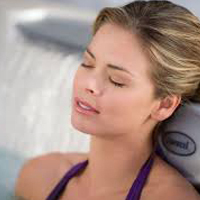 Whether your goal is to lose weight or you just want to enjoy the therapeutic massage programs that a hot tub can offer, there is no doubt that becoming a hot tub owner is a wonderful investment for your health. To learn more about the different features and models that we have available, click here to download a hot tub buyer’s guide.